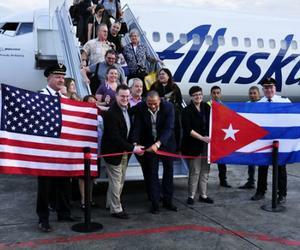 The eighth and last US airlines company to open commercial flights to Havana was Alaska, which opened that route on Thursday with a flight from Seattle to the city´s Jose Marti International Airport. Alaska´s directive Joseph Sprague thanked Cuba authorities for having guaranteed all conditions for the daily five-and-a-half hour flight with stop-over in Los Angeles. Alaska is the eighth and last US airline company to open regular and commercial flights to Cuba along another seven who received permits to do so from the US Treasury. Air operations between the US and Cuba have developed favorably in this first month of regular flights, according to Cuban airport authorities. In 2016 the Havana International airport registered 5.3 million passengers, considered a historic traffic in its history. American Airlines, Delta, Frontier, JetBlue, Southwest, Spirit, and United are other US companies flying to Havana.